5 Easy Steps to Make Money on Betfair! No Trading & No Laying – just Profits! Stop ‘trying‘ to make money on Betfair. This method is STILL working today. It produced a massive £824.06 during a trial week during March 2014. We also did another weeks trial in March 2015 to test if it’s still profitable. It was, and it made over £400 profit in that week. After testing out 3 new methods for making money on Betfair from January to March 2014, we got one that not only hit our profit target of £250 pure profit in a week… it greatly exceeded it and produced a massive £824.06 in a week! Watch our video below and learn what we bet on and how to get the method yourself! We’re constantly testing out new betting methods/systems. This particular betting method made us over £800 profit in a week! Using 5 Step Betfair Profits (this system) for just 1 week, we bet on 3 sports, Darts, Snooker and Tennis. We won £360 on Darts, £253 on Snooker, and £210 on Tennis matches – all PROFIT. We’ve written a simple 10 page PDF guide & created a 39 minute explanation video explaining the method, which you can download and start using yourself. Did we just get lucky during our test week and make profits by accident? The thing is, the previous 2 weeks we had been following 2 other systems and they consistently lost or broke even during those weeks. We don’t consider those ‘bad luck’ – we consider those to be losing methods. We knew from the amounts we were betting during the third week, and this new third method, that anything over £250 PROFIT would be a success, and MAY just be a bit lucky, which would warrant MORE TESTING for the following weeks. BUT – this new method BLEW AWAY OUR £250 TARGET, over THREE TIMES as successful as we’d hoped (if it was a good system or just had good luck during the week). This wasn’t just good luck, it was either incredible, amazingly flukey good luck, OR a pretty solid way or winning PROFITS from betting on sports! During the week it kept working again and again and on ALL THREE sports we chose to test it on! Not a single sport produced a loss in the week overall! Is that luck? No, it’s 5 Step Betfair Profits! This is a 100% no bull$hit method! We are including the spreadsheets showing ALL our profits and losses from Betfair, downloaded and included with the PDF Manual, completely unedited. 5 Step Betfair Profits will teach you the exact method we used to make £824.06 profit in a single week using Betfair, betting on sporting events. This includes exactly what sports we bet on, and why. We show what criteria we used to choose and pick the matches we actually bet on, and which ones we chose to avoid. You’ll learn how much we used for each bet and expected to win. All the results we had during our test week – the ACTUAL SPREADSHEETS downloaded from Betfair are included in the ZIP file you’ll download after purchasing. Betfair is where we used the system, but in theory you could use the same method on other sites too. 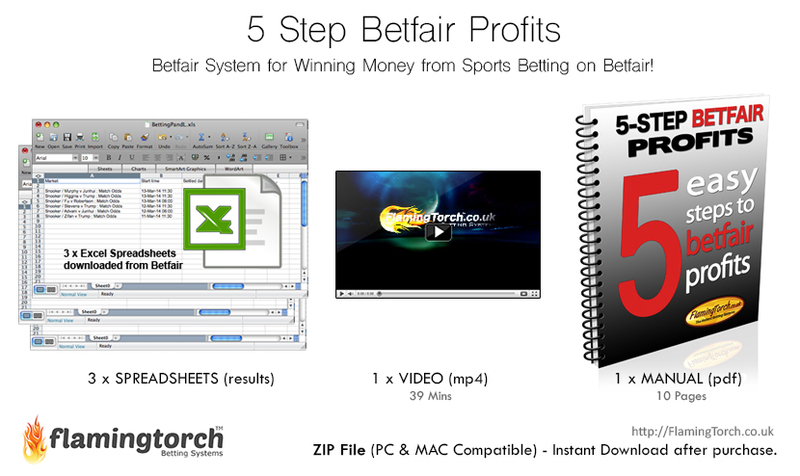 What type of system is 5 Step Betfair Profits? It’s a Sports Betting System. This isn’t a system where we tell you exactly what to do – we’ll tell you exactly what WE did and what happened, so you can choose to copy us or modify anything you like. If you want an answer to this question, the answer is whatever you feel comfortable with starting with. No, you don’t have to. The system works by picking certain matches and betting BEFORE they begin. Can I bet on Horses? No, this is mainly for 1 on 1 sports like Tennis, Snooker & Darts. Can I use this on Casino games? No, this is for sports betting only. Can I bet on Football and other team sports? We used it with 1 on 1 sports, not team sports. But, in theory you could, if there are 2 teams and only 2 possible outcomes, or maybe 3 outcomes (win lose or draw). But not Horses or sports with multiple opponents. Most bets will be small amounts of under £20 – that’s what we did – you could bet whatever you like! But the amount you bet on each match depends on how likely you are to win that bet. In the manual we explain when to bet big (£50 to £100) and when to bet small (less than £20). This is the best method i’ve used for Sports Betting on Betfair! Been using it for about 5 weeks so far and i’m up over £650 so far. I’m happy with that as i’m not using large bets. This is really easy to learn and use. I highly recommend 5 Step Betfair Profits. Can’t review 5 Step Betfair Profits properly as I can’t use it! I travel abroad 9 months of the year and wanted something I can use in hotel rooms whilst away. I guess I should of checked first but many countries don’t allow you to use Betfair (IP block) and so I haven’t been able to use it yet. Will have to wait until i’m back in the UK. Not sure how but you’ve done it again! This 5 Step Betfair Profits is the second system i’ve got off you guys and it’s very good – used it as described and made £79 profit the first day I tried it. I did spend about 30 minutes looking into the matches and player stats before placing my bets, but after that I just placed the bets and let them run. Nice easy system well worth it. Works at bet365 too, not just Betfair! I would have liked to see more results from testing rather than the limited amount provided. It makes me wonder if this can really work long term or not. I haven’t tried the system yet as it requires a bit of time to lookup the matches and head to head past results for each player – quite a bit of work I think but I guess that’s what you need to do if you want the profits. ★★★★☆ £47 won first day! I like the fact that 5 Step Betfair Profits gets straight to the point and I could learn it in under 20 minutes reading the PDF. The video was great but the manual was enough for me to get started and I placed 9 bets the same day using the method you teach. A few of those bets did lose but I managed to come away with a profit of £47 after commissions. Not bad! START MAKING MONEY ON BETFAIR BY BETTING ON SPORTS TODAY! DOWNLOAD IT NOW! 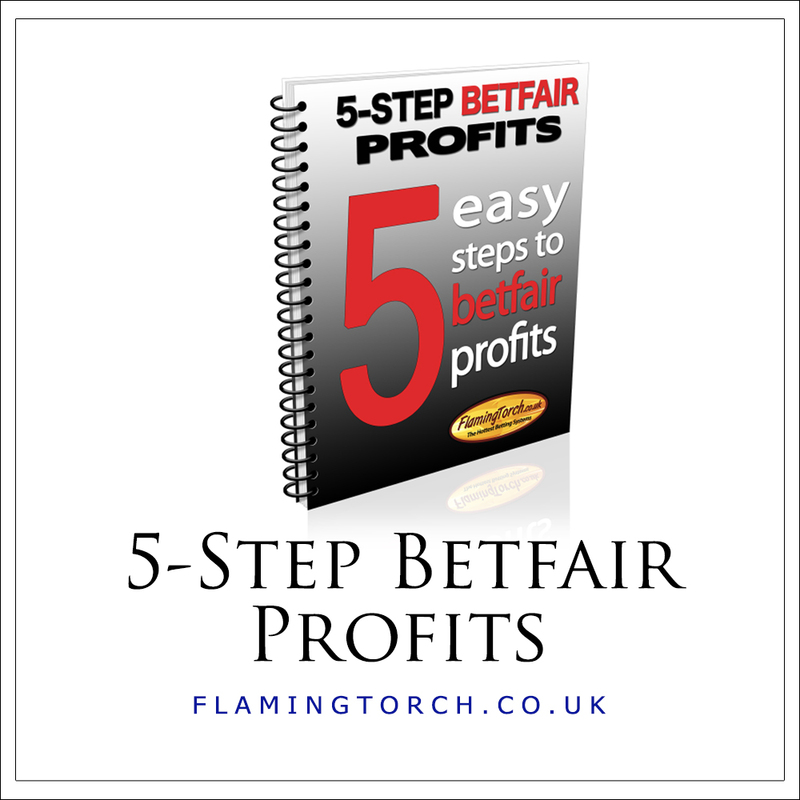 Download your copy of 5 Step Betfair Profits today and learn how to make money from Sports Betting on Betfair with our easy to follow Instructional Video & Manual. Click the Add to Cart button below.